On the 26th of February seven companies submitted bids to the Ugandan government in a licencing round which includes the Ngaji oil block which covers half of Lake Edward and large parts of Queen Elizabeth National Park, and forms part of the same continuous ecosystem as the Virunga World Heritage site. A Government spokesperson was reported in the Ugandan media today as saying that none of the companies submitted bids for Ngaji as a result of our campaign to save Virunga, but the government still plans to issue a licence for this area! The Greater Virunga Landscape is one of the most bio-diverse areas on earth and home to Africa’s most iconic and endangered species like hippos, elephants and some of the world’s last remaining mountain gorillas. Lake Edward is a vital source of food for over 200,000 people and its waters feed the Nile and Congo rivers. Any oil activities in this area could lead to significant damage to the lake, the broader ecosystem and the people and animals that depend on it. Global Witness has been campaigning for over four years to prevent oil drilling in Lake Edward and the surrounding ecosystem – read more about it here. We are calling on UNESCO and the governments of DRC and Uganda to negotiate a no-go area for extractives around Lake Edward. 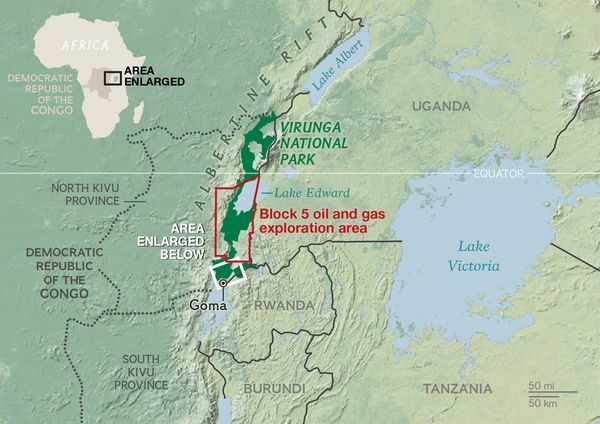 It may only be a matter of weeks before Uganda issues the oil licence in Lake Edward, effectively opening up Virunga by the back door. Don’t let this happen! Share our animation to help us raise awareness of this issue and keep the pressure up on the Ugandan government. Oil Concession in BLOCK V (38.25% participating interest in Block V + Ophir sold its stake -46%- to fellow partner Soco International in July 2012 which increased Soco’s stake to 85%) – SOCO International is an international oil and gas exploration and production company, headquartered in London. BREAKING: In November 2015, SOCO gives up oil license in proteced DRC park. British oil company says it no longer holds an exploration license in home to protected mountain gorillas in the DRC. As revealed in Global Witness’ release the Company announced in March 2012 “plans to press ahead with oil exploration in Africa’s oldest National Park and UNESCO World Heritage site, Virunga National Park in the Democratic Republic of Congo (DRC). They announced the plans on Wednesday evening, after Global Witness contacted SOCO for a response. The closing of the acquisition of Dominion Petroleum gave Ophir Energy blocks in Uganda and the Democratic Republic of Congo (DRC). Prior to its sale to Ophir, Dominion had done some work on its Block 4B in Uganda, which included drilling. Unfortunately for Dominion, and ultimately Ophir, the well was not a success. During H1 Ophir took steps to close the office in Uganda and relinquish Block 4B. The acquisition also gave Ophir a 46.75% stake in Block V in the DRC. This block has seen some issues getting an exploration program started due to environmental concerns as it lies in the Virunga National Park in DRC. After Uganda, Lake Albert, and block 3a, Total is considering exploration in DRC’s block 3. On 12 September SacOil announces the successful completion of airborne gravity and magnetic survey in Block III. “SacOil announces that Total E&P RDC (“Total”), the Operator of Block III, Albertine Graben in the Democratic Republic of Congo, has successfully conducted an airborne gravity and magnetic survey on the northern part of the Block III area, located outside the Virunga National Park. SacOil holds a 12.5% effective interest in Block I.
Adhiero a la preservación del Parque Nacional de Virunga. El área de preservación se debe mantener libre de todo interés de corporaciones que corrompen a la población para lograr sus propósitos. Las compañías de origen extranjero deberían hacer exploraciones en sus territorios y dejar en paz a los países africanos, sud americanos Etc. ” GO HOME ..!! Ellos se enriquecen y diezman poblaciones enteras dejando pocos nuevos ricos y millones de indigentes. Gracias por su comentario y soporte. Virunga se tiene que preservar para el bien de las poblaciones Congolesas de hoy y mañana. Happy Earth Day (April 22)!!! Reiterating my support to your efforts of preserving the National Park of Virunga from oil extraction!! Keep in it in the ground in favor of the local communities and the ecosystem.